"Greetings! My name is Duncan Wong and I am one of your re-elected members of city council this term. Though I was born in Malaysia, I've happily lived in Thompson for over 30 years, having graduated from R.D. Parker Collegiate in 1990 and attended the U of W for Business Administration. Today, I own and manage Wong’s Dynasty Ltd., a local business franchise consisting of Wong's Asian Bistro and Wong’s Construction alongside my beautiful wife Perrie. Meanwhile, my three brilliant daughters Jessy, Jade, and Kokia are studying in universities across Alberta, and I could not be prouder of their hard work. When I'm not busy, I'm an enthusiastic outdoorsman: I love going fishing, golfing, and especially snowmobiling. During the winter season, I'm particularly active with The Thompson Trail. For 2018, I have been nominated to serve as chair to the Public Works Committee and co-chair for the Public Safety Committee. I feel especially privileged to serve on each committee with my co-chair Brian Lundmark and chair Jeff Fountain, respectively. My experience from business budgeting for the past two decades and my knowledge in heavy-duty equipment operations from working in snow removal places me in a strong position to help and support Jeff and Brian as we work together to better serve the residents of our community over this coming term." 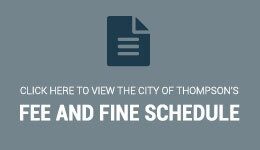 Join our newsletter to receive up to date news and events in Thompson.